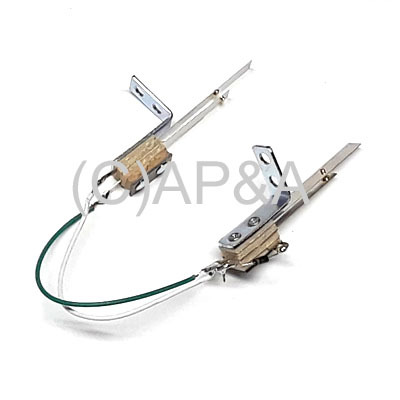 Set of 2 leaf switches riveted to 90-degree mounting brackets and connected together with jumper wires for use on slingshot bumpers/kickers in many electronic solid-state (SS) Bally and Williams pinball games (see game list below). Brackets are mounted to front (long blade side) of each switch (see INSTALLATION NOTES below). NOTE: Please verify the type of switch configuration your game uses before ordering, as these are electronic parts which are not returnable- all sales are final. Set comes configured for use in early or late model games (select above when ordering- ships for late-model games by default). Early games will use a resistor/capacitor combination on one switch. Late games will use a diode on one switch (see INSTALLATION NOTES below). Replaces older switch part #s A-4834-H (2-lug switch), B-8734 (3-lug switch with resistor/capacitor combo- used in early games), and B-8734-1 (3-lug switch with diode only- used in later games). SWITCH MEASUREMENTS: Overall length: 3-1/16 inches. Length of long blade out from switch stack: 1-15/16 inches. Length of short blade out from switch stack: 1-3/8 inches. Contact points 1-7/32 inch out from switch stack. Switch stack body: 3/4 inches long x 3/8 wide x 3/8 high. Screw mounting holes 1/8 inch diameter, 3/8 inch center-to-center. Some games require one of these switches to have a mounting bracket on the REAR of the switch, rather than the front. If your game requires this, contact us when ordering, and we can reverse the mounting bracket for you (additional charge of $3.50 per switch for parts/labor will apply). Switch contacts are wired in parallel, so that activation of either switch will make the slingshot bumper kick. Switch using a diode (late-model games) will connect to games existing wiring (green and white wires) with white wire going to lug with diodes anode (non-banded end), and green wire going to the unused lug on the switch. Switch using a resistor/capacitor combo (early-model games) will connect to games existing wiring (black and orange wires) with black wire going to lug connecting to capacitor, and orange wire going to lug connecting to resistor. BALLY: Game Show, Mousin Around, Pool Sharks, Radical!